In Egor by Daisy Lefarge, a lonely woman in a foreign city makes excuses to herself for welcoming the advances of a man she’s not attracted to. As Lefarge explores the woman’s growing guilt, offset by a worrying listlessness, she lays out lines that seem drawn from poetry: “The meshes of the afternoon tighten. Outside men sing songs of themselves. I breathe in until evening.”It’s clear that editors Ashley Stokes and Robin Jones have a keen eye for an original slant, and many descriptions stopped me in my tracks – from the “chilly contours” of one character’s ears in Ailsa Cox’s Killing With Kindness to the man who sees himself “as water into which ink has been poured” in Robert Anthony’s fable on the brink of horror, Shadows. Insights and new interpretations are offered about events that actually happened, including the 1960s psychological experiments into social obedience vs personal conscience, and the code-cracking ingenuity of workers at Bletchley Park. These are stories written, it feels, to explore questions blazing in the writers’ own minds, shared with us so we too can have the pleasure of puzzle and wonderment. And the key to this is, as always with Unthology’s carefully selected tales, the power of what’s left unsaid – as in Alexandros Plasatis’ skilful and disconcerting The Story with Yuliya Has A Bad Ending. No efforts are made to provide a neat ending, wrap up all threads or leave us with a fuzzy warm glow. If anything, the opposite is true. The restraint of each of the featured authors ensures your involvement in each tale; far from being a passive reader, you must engage your brain and actually work at teasing out the meaning – form your own conclusions while simultaneously being swept along by the ideas and imagery presented by the writers. And what can be more satisfying in a short story anthology than that? 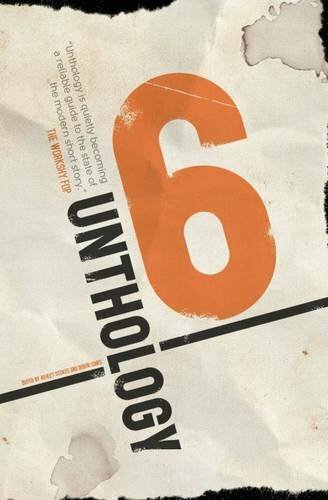 Unthology 6 is available from Unthank Books and Amazon. Read my review of Unthology 5 here. Read my review of Unthology 3 here. This entry was posted in Reviews and tagged short story anthologies, Unthank Books by Judy. Bookmark the permalink.